I'm Arvind Kumar Gupta, graduated this year from Indian Institute of Technology, Guwahati (IITG). I want to pursue research in soft matters and nanoscience. 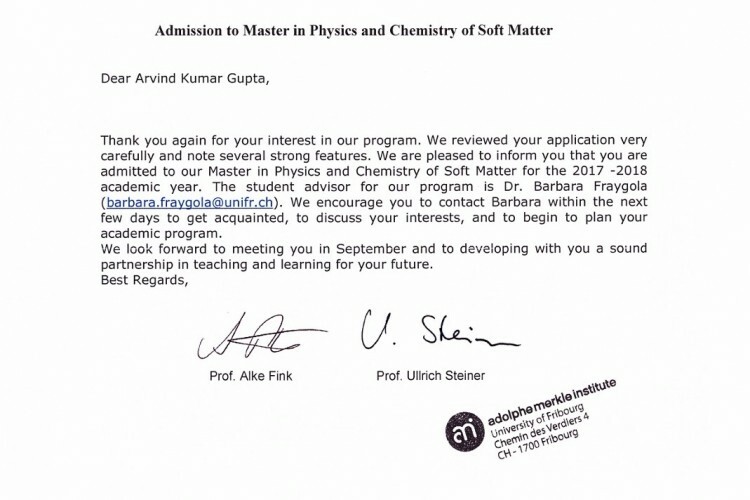 I admitted to Master program in Physics and Chemistry of soft matters offered by Adolphe Merkel Institute, University of Fribourg, Switzerland. I am looking to fund for my post graduate program. Total cost for this program is Rs 20 lakhs and I am seeking for Rs 15 lakhs. You can see the cost for this program at the link given below. As per my family concern, my father (60 years old ) is a cultivator. My mother (58 years old) is a house wife. My one younger brother is doing B.Tech (2016-2020) in Information Technology. My youngest brother is in class XI. Due to this financial constraint, my parents are not able to pay this much amount of education fee. Graduation in Chemical Science and Technolgy from Indian Institute of Technology, Guwahati. I was involved in many research projects during my graduation like the synthesis and characterization of anti-cancer drugs. These projects motivated me to shape my future in the field of research. Completed Secondary Education from Jawahar Navodaya Vidyalaya, Gorakhpur and Senior secondary education from Jawahar Navodaya Vidyalaya, Bangalore. I want to pursue research in the field of soft matters and nanoscience. Adolphe Merkel Institute has an excellent record in this field. Please help me to raise the required amount, so that I could be in a better position to pursue my interest. You can do by clicking on the donate buttuon and sharing this fundraiser with family and friends. Your share could be as good as a donation for Arvind Kumar Gupta! Not everyone can afford to take care of their loved ones. Arvind Kumar Gupta's life can only be saved by donations made by kind people like you.